Gather the family together for a fun adventure! Experience the Sheboygan River, stretch your paddling muscles, and learn about the clean-up and restoration work on a free guided trip with Camp Y-Koda! Registration Required. Contact Camp Y-Koda at yeducation@sheboygancountyymca.org or 920-467-6882. Registrants will be contacted by Camp Y-Koda a few days in advance of the trip with final details. River section featured on each trip determined by water conditions. 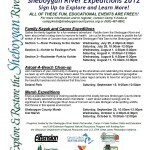 Meet to ask questions and see maps and other information regarding dredging work that was done in the Sheboygan River. Understand what it would mean to have the “dredging restrictions impairment”removed from Sheboygan River’s list of injuries. Provide your feedback at the meeting or by September 30. For more information, contact WDNR Sheboygan River AOC Coordinator, April Marcangeli at 920-893-8527 or april.marcangeli@wisconsin.gov. Meet at the University Drive wetland to join local ecologist, Scott Horzen, to see and identify some of the native trees, shrubs, wildflowers, and other plants growing in the habitat projects. Gain insight on differences in the second year of growth vs. the first year. Travel to other sites if time allows. No registration required, but for possible weather cancellations call 920-459-5918 up to two hours prior to program start. Meet Amy Kretlow on the hill on University Drive to join other volunteers in the fight against invasive buckthorn, then take a break with ice cream and your fellow river-enthusiasts. Long sleeves, insect repellent, gloves, sturdy shoes and a pruning shears or saw recommended. No registration required, but for possible weather cancellations call 920-459-5918 up to two hours prior to program start. 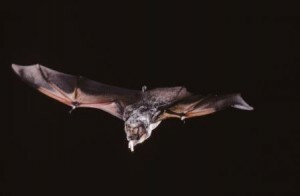 Join director of the Western Great Lakes Bird and Bat Observatory, Bill Mueller, to learn about the biology of Wisconsin bats and how to detect them as they hunt for insects in the night sky. Learn to use a fun gadget called the “Ana-Bat” detector. The training consists of one hour indoor training and one hour outdoor training, so dress for the weather. 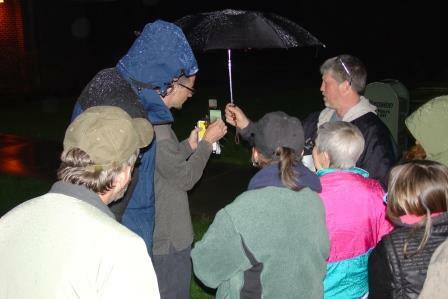 We’re looking for a few dedicated volunteers to make bat monitoring in Sheboygan their hobby! Come just to learn or come to volunteer, but please register by August 15. 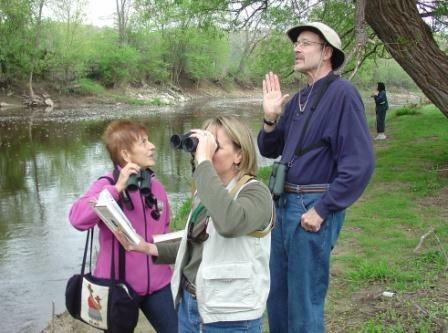 Join Dave Kuckuk, Debbie Beyer, and other local birders, for a morning walk to identify birds along the Sheboygan River. We’ll start at Esslingen Park and drive to other project sites and eBird hotspots as time allows. Drop in for just a short excursion before work, or stay for several hours. Our observations will be submitted to ebird. Bring your binoculars and field guide. Enjoy fresh air and exercise along the river cutting or pulling garlic mustard, buckthorn and other invaders. Then take a break to enjoy ice cream and socialize with your fellow river-enthusiasts. Long sleeves, insect repellent, gloves and sturdy shoes encouraged. Meet on University Drive along the Sheboygan River. For possible weather cancellations call 920-459-5918 two hours prior. 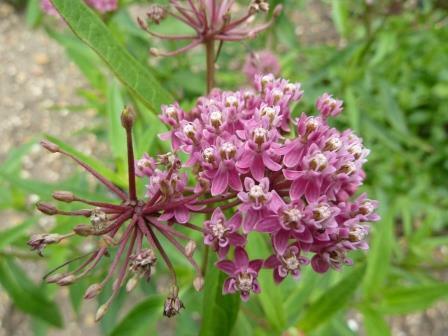 Join local ecologist and Sheboygan River project contractor, Scott Horzen, to see and identify some of the native trees, shrubs, grasses, sedges and wildflowers planted at the habitat projects. Discuss their ecological importance and get ideas for “going native” with your own landscaping. Park along University Drive and begin with a walk in the wetlands across from Lutheran High School. Travel to other sites if time allows. For possible weather cancellations call 920-459-5918 two hours prior to the program start. We have an exciting and unique opportunity to establish native wildflower gardens as a backyard habitat restoration demo along the Sheboygan River at the new Glas Coffee House on 14th Street. The Sheboygan River Basin Partnership is seeking funding for the native plant stock and is hoping volunteers will help with planting this spring. If interested, please leave a message for UW-Extension Sheboygan River Volunteer Coordinator, Amy Kretlow at 459-5918 or akretlow@uwm.edu. eBird 2014: Calling all birders! We’re looking for a few people to regularly bird along the Sheboygan River Area of Concern and enter their observations on Cornell Laboratory’s eBird web-based database. Birders of all skill levels welcome! Experience the Sheboygan River, stretch your paddling muscles, and learn about the clean-up and restoration work on a free guided trip with Camp Y-Koda! To register contact Camp Y-Koda at 920-467-6882 or yeducation@sheboygancountyymca.org Registrants will be contacted by Camp Y-Koda a few days in advance of the trip with final details. River section featured on each trip determined by water conditions. Enjoy a morning walk or paddle along a stretch of the Sheboygan River picking up litter in this great family and community event! In cooperation with the Sheboygan River Basin Partnership and the UW-Extension, we will again be picking up trash along various stretches of the Sheboygan River and other local areas. Bring your own canoe, use a Camp Y-Koda canoe for free, or walk a riverside park. Please be prepared for any kind of weather; rain, sleet, or sunshine, we will be picking up litter! Come join Amy Kretlow and Debbie Beyer to walk one of the Sheboygan River bat survey routes and practice using the Ana-Bat Detector. We’ll walk a survey route and collect data to accompany additional data being collected by volunteers (some of you!). Wear good walking shoes and bring insect repellent! For possible weather cancellations call 920-459-5918 two hours prior to the program start. WDNR biologist, Paul White, will teach about the biology of Wisconsin bats and how to detect them as they hunt for insects in the night sky. Learn to use the “Ana-Bat” detector, which is a gadget that records bat vocalizations imperceptible to the human ear. Also, learn how to search for bat roost locations. Expect a 1-hour indoor program followed by 1-hour outdoor practice. Good walking shoes a must! This prepares you for loaning the Ana-bat to do your own surveys, or for joining the group bat walks. Registration required. Join Debbie Beyer for a training on Wisconsin frog and toad biology, how to identify their calls, and techniques for participating in Wisconsin’s Frog and Toad Survey. This training is encouraged if you plan to join the Frog’n Fridays. Registration required. Join Debbie Beyer, UW-Extension, and Caitie McCoy, Illinois-Indiana Sea Grant, for this update on Sheboygan River fish and wildlife and community perceptions studies. Learn about next steps and how you can be involved in helping the Sheboygan River heal. Gather for a brief presentation of recent history in the restoration of Sheboygan River fish and wildlife by UW-Extension educator, Debbie Beyer. Bring along artifacts (photos, objects, articles, etc.) 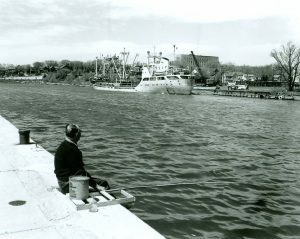 you’d like to show others pertaining to the Sheboygan River’s past or present and share your Sheboygan River story in (5 minute segments) informally with the audience. This program is the kick-off of a Sheboygan River oral history project for documenting the variety of experiences and memories people have of the Sheboygan River. The Winners of the Sheboygan River Billboard Contest. Camp Y-Koda pick up liter by canoe or on foot, or stencil storm drains. Free lunch and activities at Camp. Great individual, family, or club volunteer event! Contact Camp at 920-467-6882 and campykoda@sheboygancountyymca.org to register. Curious about what is happening on the river? Meet in the upper dining room of the Highland House Restaurant on November 28th and UW-Extension Offices (5 University Dr. Sheboygan) on December 12th for a brief update of the dredging and habitat restoration activities. Ask questions, get answers! No registration required. Meet at the Sheboygan County UW-Extension Office, One University Drive, Room 5024 for a brief overview of the habitat and dredging projects, then caravan in your own vehicle to the project sites. Rain or shine, dress for the weather. No registration required. Call 920-459-6644 to register by November 5 for your free lunch. Remove Invasive Plants – See Spawning Salmon – Get free lunch! 8:00-9:00 Willow Creek invasive plant removal. Activities will include cutting and piling buckthorn and honeysuckle bushes on the banks of Willow Creek, a trout stream that has excellent fall salmon viewing. Meet at Plank Road Trailhead on Erie Avenue (1/2-mile west of Shopko) (see map). Dress for the weather and bring gloves and pruning shears, if you have them. Take a tour! 9:30-11:00 Tour the Sheboygan River clean-up and habitat projects. 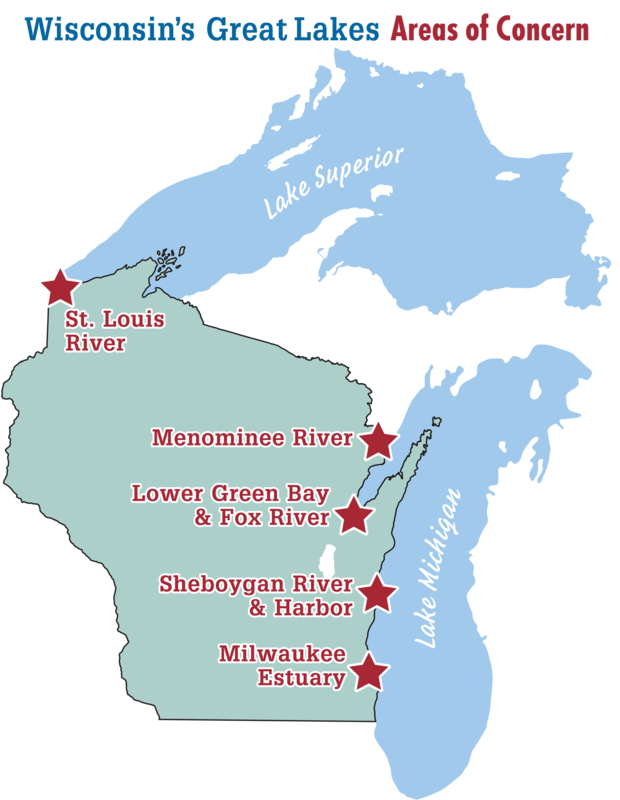 Meet at Sheboygan County UWEX office, Room 5020 for a brief overview, then caravan down the river to view projects sites. Free lunch for registered participants! 10:00 – 2:00 Today’s your lucky day! All registered participants for these programs get free lunch tickets. Take your free lunch ticket to Gander Mountain where the Sheboygan River Basin Partnership (SRBP) will thank you for your efforts and give you a free lunch – brat/hamburger, cookies and soda/water! 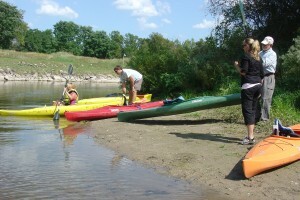 Sheboygan River TAC and CAC River Tour, on Monday, September 17, 2012 @ 9:30 – 3:00 p.m. The Sheboygan River is a-buzz with restoration and remediation! Tour 3-4 habitat restoration project sites, watch 2-3 dredging projects in action and hear about the steps, challenges, advantages, and lessons-learned in going from planning to implementation in a 2-year timeframe. This trip is geared toward agency staff and those participating on Wisconsin AOC technical advisory committees and community/citizen advisory committees. 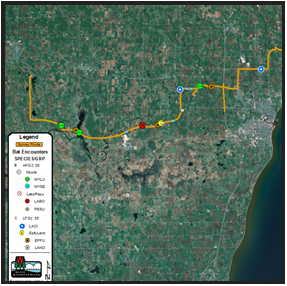 We will meet at the Sheboygan County UW-Extension Office http://sheboygan.uwex.edu/office-map-and-directions/ and bus participants from there. Full agenda is linked below. Gather the family together for a fun weekend adventure! Paddle down the Sheboygan River and learn about what is being done to improve its health. Join us for the entire series to paddle the full stretch of the Area of Concern from just past the Sheboygan Falls Dam to the Sheboygan Harbor! Join members of your community in cleaning up the shorelines and celebrating the Great Lakes as we team up with Alliance for the Great Lakes! The Alliance for the Great Lakes brings together thousands of volunteers throughout the Great Lakes region annually to have fun and give back to the beautiful beaches and shorelines that they love. Your activities may be impacted by the operations associated with these projects in 2012. Please join us for presentations, displays and discussion to learn about project goals, plans, time lines, boating, traffic logistics, and more. Presentations by: U.S. Environmental Protection Agency U.S. Army Corps of Engineers City of Sheboygan—SEH, Inc. With additional exhibits by the Wisconsin Department of Natural Resources and the Sheboygan River Basin Partnership. DescriptionSheboygan River Kayak Expedition Wednesday, October 19, 9:00am-12:00pm, EOS on South Pier Follow the current and explore the Sheboygan River AOC – watch for wildlife, enjoy the scenery and sounds, maybe even bump into a few salmon! Gain an understanding of why the Sheboygan River is considered one of the 43 most areas in the Great Lakes drainage basin needing special attention and what you can do to help restore its health. Sheboygan River Expeditions 2011 Sign Up to Explore and Learn More! For more information and to register, contact Camp Y-Koda at campykoda@sheboygancountyymca.org or (920)-467-6882. DescriptionSheboygan River Salmon Safari Wednesday, October 5, Esslingen Park Learn about the ecology of highly sought-after salmon, gain a few tips for catching them from local experts and view them as they swim by. Uncover the meaning of the expression, “match the hatch” and develop an understanding of lifecycles and relationships beneath the flowing water of the river. Annual September Adopt-A-Beach Clean-up Saturday, September 24, 9:00am-12:00pm, Deland Park Join members of your community in cleaning up the shorelines and celebrating the Great Lakes! The Alliance for the Great Lakes brings together thousands of volunteers throughout the Great Lakes region to have fun and give back to the beautiful beaches and shorelines that they love. Sheboygan River Kayak Expedition Monday, September 12, 1:00pm-4:00pm, EOS on South Pier Follow the current and explore the Sheboygan River AOC – watch for wildlife, enjoy the scenery and sounds, maybe even bump into a few salmon! Gain an understanding of why the Sheboygan River is considered one of the 43 most areas in the Great Lakes drainage basin needing special attention and what you can do to help restore its health. Rhythms of the River – Sheboygan River Celebration and Fundraiser Wednesday, September 7, 5:00pm-8:00pm, Highland House Restaurant Invite your friends, relatives and fellow water conservationists to celebrate the phenomenal effort underway to clean-up and restore the Sheboygan River. Enjoy a meal, brief program and music at the Highland House! Music provided by Great Lakes folk artist, David H.B. Drake. $1.00 from each ordered entrée (anytime Sept. 7) will support Sheboygan River Basin Partnership projects and programs. Historic Camp Marina Superfund Clean-up Tour Tuesday, August 16, 12:15pm-12:45pm Join us over the lunch hour to see and hear details of the monumental task of cleaning up PCBs, PAHs and NAPLs that have persisted for decades. Dress for the weather. Program is on-site at 10th Ave. and Water Street in Sheboygan. Discover why bats are important to the Sheboygan River ecosystem and what is being done to learn more about them. Your bat-expedition begins indoors, then takes you outside for a walk along the river to detect bats with your eyes and a high-tech bat detector! Presented by: Western Great Lakes Bird and Bat Observatory, WDNR, and UW-Extension. Sheboygan River Expeditions 2011. Sign Up to Explore and Learn More! For more information and to register, contact Camp Y-Koda at campykoda@sheboygancountyymca.org or (920)-467-6882.